Arts Need Something To Do Saturday? Are you looking for handmade gifts? Do you relish the locally homespun? 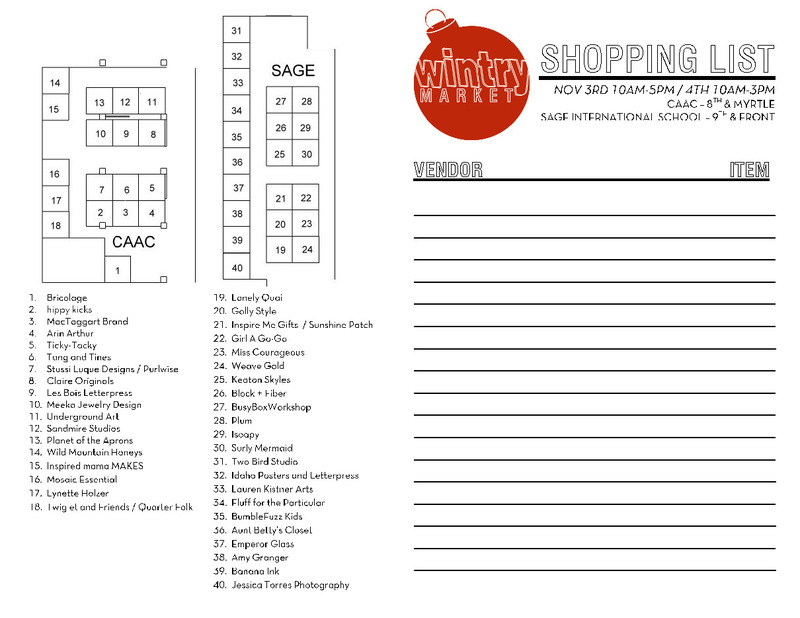 Then check out the Wintry Market, where vendors with inventive wares will set up shop at two locations: the Sage International School at 601 S. Ninth St. and the Creative Access Arts Center at 500 S. Eighth St. in downtown Boise. The more than 40 vendors will include Aimee Babneau Art & Design, Les Bois Letterpress, Mosaic Essential and Sandmire Collections, which specializes in Italian-style photographic art. A map marked with vendor locations is available online, and on-site vendors will provide food and drink to market-goers. The event takes place from 10 a.m.-5 p.m., and Sunday, Nov. 4., from 10 a.m.-3 p.m. Admission is FREE.